Ascending Butterfly: Today's Words of Inspiration + Winner's Announcements + NY Wine Fest Recap! Today's Words of Inspiration + Winner's Announcements + NY Wine Fest Recap! This past weekend I had the pleasure of attending The New York City Wine Festival, and I had a fantastic time! I'm no expert, and I let the reps know I was fully in their hands and to make recos on what I should try and in what order. They were super happy to explain the notes and describe the flavors. I also had the chance to meet great people between appetizers and tasting, and it concluded with an amazing concert. I can't wait for the next one. I started off so nervous not fully knowing what to expect or how a total newb would even be received, and I learned right away I had nothing to fear, and there were other wine novices who seemed visibly relieved when I asked for recos because some were too afraid to admit they didn't know very much about wine either. I was totally in the moment and greatly enjoyed the great wine, food, music and company! I hope the Ascending Butterfly readers who won our giveaway for a pair of tickets will also write in and let us know how they enjoyed the event. It's amazing when you stop and think that grapes can become something so luxurious. A wine at it's core is nothing without the grapes. And the event left me thinking about how the ordinary in life can easily become extraordinary via time and transformation. And isn't that much like us? We undergo changes and transformations daily, some seem so negligible when we are in the midst of them, but then we realize later on just how profound they really were! Today I want you to be inspired by your changes and transformations, celebrate both the ordinary and extraordinary in your life, and don't be afraid to ask for recommendations, you may just discover a new favorite! Being at the Festival also reminded me that the fruits of our labors are those indulgences and moments we allow ourselves to savor. Today let good music, good friends, and good wines inspire you! 1) - Ends 02/14 - $50 digital gift card to Cheesecake.com Giveaway! - Enter HERE! Congratulations to **Amanda** and **Clenna** our BearPaw and Energy Muse Freedom Beads Winners! I know Amanda is going to love staying warm with her new BearPaw Boots! And I know Clenna is going to be keeping her Chakra's aligned in style with her new Necklace! 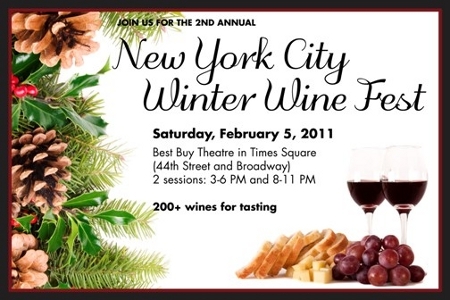 And congrats to ** A-Ro ** and ** Theo ** our NY Winter Wine Fest winners! Special Thanks to Marquee Concerts, Bearpaw and Energy Muse for hosting another amazing giveaway, we hope to have you back soon!